THERE WILL BE PIE! Lots of it! 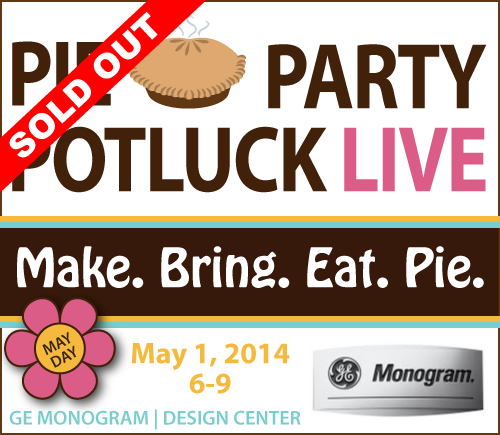 Apologies to the many wonderful members of our community of food bloggers, writers and professionals who missed out on tickets to Pie Party Potluck LIVE May Day 2014. Ken and I set out to create events that this community would LOVE to go to and this event is back-by-popular-demand for the third time. It was sold out in about two hours—so you like it, you REALLY like it! While we’d love to move this event to a bigger space so more of you could come, we’d would miss out on the generous hospitality and sponsorship of Paula Cecere, Chef Tagere and the team at GE Monogram Design Center. Julia Stambules, who works with WÜSTHOF and Anolon—two of this year’s sponsors—asked me, “What do the attendees experience when they walk in the GE showroom?” I said, “The most common reaction is asking, “Can I stay here forever?” The space is gorgeous with kitchens and appliances any of us would be thrilled to have. Plus, there’s a sea of pies to eat and discuss over hors d’oeuvres and drinks. Why would you ever want to leave? We very excited to have Kerrygold, Jarlsberg, OXO, Dub Pies and Woolwich Dairy and more on board as sponsors as well. This event would not be possible without them and we are extremely grateful for them and our community for their enthusiasm and support of this event. If you’re not averse to drooling, follow the PARADE OF PIES, a list of pies and pie makers that will be attending Pie Party Potluck LIVE. The hash tag is #PiePartyGE on Twitter, Facebook, Instagram and Google +. This an industry-only event. If you are in the business and would like to try to grab a last-minute ticket, please get on the waiting list. Want Your Product to Reach 70 Food Bloggers and Food Professionals?